Performing across the world for more than thirty years, the Alexander String Quartet is an important advocate of new music. Widely admired for its interpretations of Beethoven, Mozart, and Shostakovich, the quartet’s recordings have won international critical acclaim. 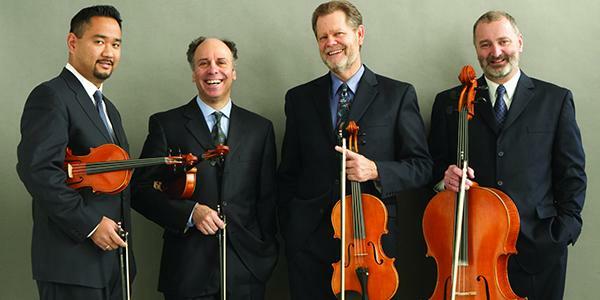 With over 30 commissions, the Alexander String Quartet is a major artistic presence in its home base of San Francisco. The quartet has performed at Lincoln Center, 92nd Street Y, and in countries from Panama to the Netherlands. Blessed with “poetic and sensitive pianism” (Washington Post), Joyce Yang returns to Soka with her virtuosity, lyricism, and interpretive sensitivity. As a Van Cliburn International Piano Competition silver medalist, Avery Fisher Grant recipient, and Grammy Award-nominated recording artist, Yang showcases her colorful musical personality in solo recitals and collaborations with the world’s top orchestras and chamber musicians. *Commissioned by Soka University, Arizona Friends Chamber of Music, University California Davis, and San Francisco Performances.